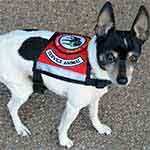 Federal law doesn't require your service dog or emotional support animal to wear any identifying accessories (ID cards, vests with patches, or service leashes and collars). 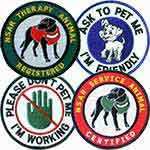 But without some of these on your animal, confrontation and refusal by store employees, restaurants, security personnel, park rangers, etc. will be the norm - not the exception. And NO one needs that! 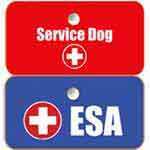 For some reason, if the public doesn't see these identifying accessories on your service dog or ESA, they immediately assume your animal is just your pet, and it's often difficult for them to get past that. 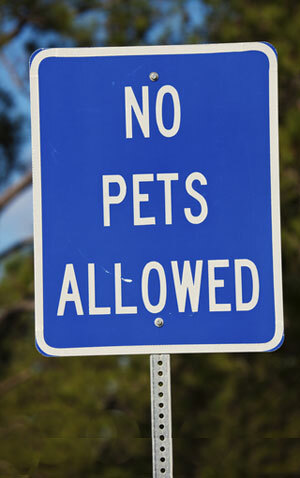 Good luck trying to convince the young, untrained employee or mall security person that your service dog or ESA is NOT a pet. Don't Be a Victim of Embarrassing Confrontations! 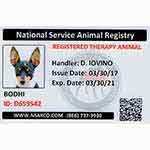 NSARCO is here to help you minimize these embarrassing confrontations and rejections by offering you a wide variety of official registered ID cards, service vests with patches, service leashes, and service collars. These identifying accessories work! 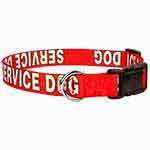 National Service Animal Registry employs several disabled people, and every person has told us the difference our official, USA-made products have made when in public with their animals was life-changing. 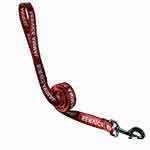 You can purchase these as individual items or save money by purchasing the service dog registration kit or emotional support animal registration kit that is right for you.